As explained in the topic loupe (magnifying glass), an object appears small when viewed from a great distance and looks great when viewed at close range. The difference in the size of the object seen by the eye is caused by the difference in angle between the eye and the object. When an object is very far away from the eye, the angle between the eye and the object is smaller so that the image formed on the retina of the eye is also smaller. Conversely, when the object is close to the eye, the angle between the eye and the object is larger so that the image formed on the retina of the eye is also more significant. The closer to the eye, the higher the angle between the eye and the object, so that the image that forms on the retina is also getting bigger. Please note that the average human eye has a near point is 25 cm so that the distance between the eye and the object cannot be smaller than 25 cm. It can be concluded that the angle between the normal eye of an average human and an object is maximum when the distance between the eye and the object is 25 cm. 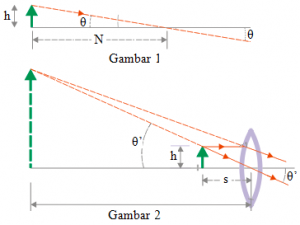 If after being brought closer to 25 cm from the normal eye, an object cannot be seen clearly, then an optical instrument is needed to help the eye see the object. A simple loupe or magnifier functions to increase the angle between the eye and the object. The ability of loupe to magnifying the image is expressed by the angular magnification (M). A loupe that has a 2x angular magnification is, of course, better than a loupe that has 1x angular magnification. The angular magnification (M) is different with the linear magnification (m). The general equation of the angular magnification is derived in more detail in the following review. To make your understanding easier, observe the figure below. In figure 1, objects are seen directly from the near point of the normal eye. 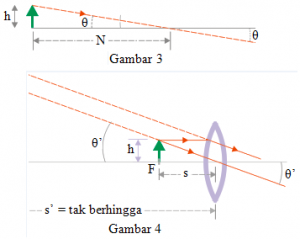 M = the angular magnification, N = the near point of the normal eye, do = the object distance. This is the general equation for the angular magnification of the loupe. It is called a general equation because the distance between objects with the loupe (do) is not of particular value but can be of any value. What if when see objects using a loupe, the observer’s eyes focused on the far point? If the eyes are accommodated minimum, then the image distance is infinite. For the image to be infinite, the distance between the object and the loop must be the same as the focal length of the loupe (compare the explanation on the topic of the loupe (magnifying glass)). See the figure below. In figure 3, objects are seen directly from the near point of the normal eye. In Figure 4, objects are seen through a loupe where the observer’s eyes are accommodated minimum (eye focused at far point). M = angular magnification, N = near the point of the normal eye, f = the focal length of the loupe. 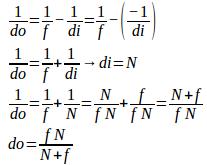 This equation shows that the angular magnification (M) of the loupe is inversely proportional to the focal length (f). The higher the focal length, the smaller the angular magnification. Conversely, the smaller the focal length, the higher the angular magnification. The loupe is a convex lens so that it should use a convex lens that has a small focal length or a convex lens that has a small radius of curvature so that the magnification of the loupe is large. What if when you see objects using the loupe, the observer’s eyes focused at near point (accommodation is maximum)? If the eye has maximum accommodation, the image distance produced by the loupe is the same as the near point of the normal eye. Images are virtual, so the image distance (in) is negative. 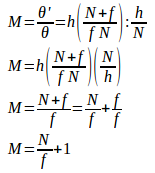 M = the angular magnification, N = point near of normal eye, f = the focal length of the loupe. Compare the equation of the angular magnification when accomodation is minimum (eye focused at the far point) with the equation of the angular magnification when accommodation is maximum (eye focused at the near point). Based on these two equations, can be concluded that the angular magnification is greater when the accommodation is maximum (eye focused at the near point).